The Project Download Archive shows link and details on fixes for latest z390 release plus any and interim fixes for severity 1 RPI's. For RPI details on prior z390 releases, see z390 Download Archive History. For pending RPI requests visit RPI Support Request Log. 1) Correct zcobol\z390\ZC_PACK31 to correctly handle fields where z and p are shorter or longer than required. Additional regression tests have been added to zcobol\test\TESTCMP4.CBL to test different code paths. 2) Correct additional errors and use G to handle F and H type field scaling to avoid overflow. Add 4 additional regression tests TESTADD2, TESTSUB2, TESTMPY2, and TESTDIV2 to zcobol\test for additional code coverage. 3) Update zcobol\demo\U2.CBL and U6B.CBL with expanded array size for zcobol debugging. 1) Correct zcobol\ZC_CALC.MAC to set implied decimal scale for all moves to floating point fields to 0. It was incorrrectly using scale of source field causing scale errors in some cases. Additional tests have been added to zcobol\test\TESTCMP4.CBL. 2) Correct zcobol\z390\GEN_COMP to set correct length on CP field after scaling for decimal alignment and correct setup for CVBG using 16 byte packed fields. 3) Correct zcobol\z390\ZC_PACK31.MAC to correctly handle padding packed field with zeros on left when larger than source zoned field. 1) zcobol\z390\GEN_MOVE.MAC scale value during move when implied decimal is different. See new regression test zcobol\test\TESTMOV3.CBL. 2) zcobol\z390\GEN_ADD.MAC, GEN_SUB.MAC, GEN_MPY.MAC, and GEN_DIV.MAC scale result as required when implied decimal points are different. See new regression tests TESTADD1, TESTSUB1, TESTMPY1, and TESTDIV1 in zcobol\test. 3) Correct GEN_OPEN and GEN_CLOSE to set base for DCB's and update GEN_BASE to insure that base has at least 256 byte range for access to any part of field or control block. 1) zcobol\IF.MAC - support literal '(' and ')' by distinguishing from conditional test (...) based on context. 2) zcobol\z390\SIX.MAC - correct &&sym_name on PACK for Z type subscript field. 3) zcobol\IF.MAC - correct OR logic for (....) OR (...) tests. 4) zcobol\z390\GEN_COMP.MAC reset field1 length for CLCL prior to loading register addresses. 5) zcobol\z390\GEN_COMP.MAC force use of CLC versus CLCI when literal length is greater than 1. 6) zcobol\z390\GEN_ADD.MAC, GEN_SUB.MAC, GEN_MPY.MAC, GEN_MOVE.MAC, and GEN_RMD.MAC use D2A to retrieve negative index parm in NOALLOW mode as a result of RPI 1204. 1) Handle 'INSPECT. REPLACING ALL lit1 by lit2' without test where lit1 and lit2 can be literal symbols such as LOW-VALUES and SPACES. See zcobol\INSPECT.MAC. 2) Prevent duplicate allocation error for DFHRESP. See zcobol\ZCDFHLIT.CPY. 4) Handle multiple character MOVE with explicit offset and length such as MOVE F1 TO F2(2:2). See zcobol\z390\GEN_MOVE.MAC. 5) Support EVALUATE TRUE/FALSE WHEN condition syntax. See zcobol\DATA.MAC and zcobol\WHEN.MAC. 7) Correct error when WS items start with 05 instead of 01 by forcing 01 FILLER level at start in zcobol\z390\GEN_ID.MAC. 8) Correct error when referencing field with subscript 1 and occurs of 1. See change in zcobol\ZCGETFLD.CPY. 10) Correct zcobol\z390\GEN_BASE.MAC to set using when new base address is outside LAY displacement range. 11) Correct zcobol\z390\GEN_INIT_WS.MAC to set base for each WS item being initialized in case multiple bases required. 1) Correct ACCEPT to display ENTER field-name. 2) Correct GO TO to handle short form GO label and not assume it is a model statement for ALTER. 3) Correct GEN_PERFORM and GEN_LABEL to call GEN_BASE_RESET to prevent base corruption. 5) Correct zcobol\IF.MAC to use separate R2 and R3 for subscriped field comparisons (it was using R2 for both). 6) Add ZC_WS_END data field at end of WS before linkage section to force multiple level occurs item completion. 7) Correct zcobol\z390\GEN_MOVE to use IILF instead of LHI to handle moves over 32767. 8) Correct truncated move of type P, Z, or 9 to right align versus left align for X and other types. 9) Correct zcobol parser to not allow commas embedded in open linterals in proc div like they are in data div for pics. 10) Correct zcobol\z390\GEN_MOVE to put offset in front of source to handle subscripts. 11) Correct zcobol\ZCGETFLD.CPY and new zcobol\z390\GEN_RMD.MAC to support variable offset in RMOD (off:len). 12) Correct zcobol\z390\GEN_BASE.MAC to reset LRU pointer whenever a base is reused so true LRU is used first. 13) Correct zcobol\WHEN.MAC to generate base for index variable after each WHEN label. 14) Correct zcobol\z390\GEN_SIX and zcobol\z390\GEN_RMD to not use GEN_BASE and use SIX_REG and RMD_REG 15. 15) Correct zcobol\z390\GEN_MOVE to specify length of source temp field for ZAP in complex compute expression using PD fields. 16) Correct zcobol\MOVE to issue repeat GEN_BASE for source to handle multiple move target fields. 17) Correct zcobol\z390\GEN_MOVE fo add length for source temp storage field in ZAP. 18) Correct zcobol\z390\GEN_MOVE to add missing conversion from type Q to Z. 19) Correct zcobol\IF.MAC to allow '(' or ')' as literal after = in IF tests. 1) Duplicate )) at end of AIF before macro label. 3) Use D2A function to prevent SETA string error in rt\test\zstrmac2.zsm structured translator utility. 1) Correct all macros in z390\mac, z390\zcobol, and z390\cics to remove comments beyond 80 characters to prevent errors when using CHCSRC(3). 2) Correct old bug in FREEMAIN by changing 0777 offset to 0. 1) LAY shows 64 bit register instead of 32 bit. 2) BALR, BCR, BCTR, BASR should not show second register if R0. 1125 07/24/10 W7 E 1 Add 135 new z196 processor instructions to z390 assembler and problem state instruction z390 emulator. As part of adding ALSIH, also correct ALSI and ALGSI to correctly indicate borrow condition using shared condition code setting functions. 1) See rt\test\TESTINS1.MLC for assembly test of all instructions including z9, z10, and z196. 1128 09/09/10 W7 E 1 Regression test using Windows 7, Intel Core i7 960, and J2SE 1.6.0_21 x64. Also test Vista and XP with J2SE 1.6.0_21 x32. 3) Convert the following keyword parms to look for YES/NO values and also check for misspelled keyword parms by verifying that only 1 positional parm is defined: REUSE=NO, UNIQUEKEY=YES, UPGRADE=YES, UPDATE=YES. 2) Correct path for new AIX to match catalog. 4) Correct parsing of PUNCH statements to prevent Java trap when there is missing ending quote for text parameter. 5) Add macro assembler trace TRM line for each ACTR statement executed showing the calculated value of the new limit. 6) Correct options typo allowing CDF option instead of EDT. 1) Update linklib\REPRO.MLC to support creation of alternate indexes in addition to primary index during load. Set INFILE to base cluster, and set OUTFILE to selected alternate index defined in catalog. Correct vz390.java, mac\ZDEFINE.MAC. 1) Support SORTIN, SORTOUT, SYSIN, SORTWK01 and SORTWK02 DDNAME file definitions. 2) Support subset of standard mainframe sort SYSIN commands including fixed or variable length records with multiple key fields defined via command SORT FIELDS=(offset,length,type,A/D,,,,). The supported types are AC, BI, CH, FI, FL, PD, and ZD. 3) Support any size file performing phase 1 sort into sorted strings and phase 2 merge if required with 1 or more merge passes using dynamically allocated SORTWK01 and SORTWK02 until single sorted file is output. 1) ending with "\." or "/." 2) including "./" or ".\"
1) Support TRS file without any path by adding SYSDAT(.) and SYSPCH(.) to zpar|ZPARTRS.OPT options file to override default program directory. The OPT file is now included in the 3 command files zpar\ZPARTRA.BAT for assembler, zpar\ZPARTRC.BAT for COBOL, and zpar\ZPARTTRS.BAT for mixed COBOL and assembler. 2) Generate copy of all error messages on TRS output file with prefix ERR= and include display of total errors at the end of report. Any errors currently only appear on zpar\ZPARTRS.ERR log. 3) Force all module names to uppercase for compares. 4) Eliminate MAIN parameter and extract main program name from first LOAD in TRE file. 5) Display total CBL, ECC, ASM, and ECA source lines loaded from PRN source file and totals included in source trace output. Note the same line can be listed multiple times when switching between runtime code and inline code or when looping. 6) Display total skipped TRE assembler lines and messages. 7) Issue error if no source lines loaded from an included PRN file. This could be due to PRINT NOGEN or compile prior to v1.5.01a. 8) Display total LST files loaded and the total number of PRN source module files INCLUDE'd and EXCLUDE'd. 9) Issue error at end for any INCLUDE source module PRN file not found. 10) Reset LST/PRN AREAD file to force open at beginning when file is loaded more than once. 11) Add new LOADLIB(path) parameter to specify path for all LST and PRN files otherwise use path in TRE trace file for LST files and use path in LST files for PRN files. 1) Correct SFE command with color and/or highlight attributes to not advance field start by 1 extra position. This is the same information that is already stored in EPIED block for ESPIE. See updated PSAD DSECT macro. 6) Correct conversion file separators (\ and /) for Windows and Linus so they can be used interchangeable. 7) Remove path from generated COPY pgm_ZC_LABELS statement and use program path. 8) Replace String replaceAll with pattern match replace functions to speed up conversions for \ to /,/ to \, - to _, ' to '', " to ', & to &&, && to &, '' to ', and "" to "). 9) Consolidate all tz390 required initializations into init_tz390. 10) Support user override of CBL suffix for zcobol programs. 3) Correct X2A function in mz390 to return 0 value if hex invalid. 4) Add regression test rt\RTZPAR.BAT. 1) If default option COMMENT is on, then comment form of each zcobol verb call statement is generated for use by ZPARTRS to extract COBOL source from PRN file when generating COBOL and assembler source trace of execution. Comments start with *ZC. 2) DISPLAY of single character literal optimized to generate inline WTO versus call to runtime display routine supporting multiple fields and multiple types (replaced over 50 executed instructions with 2). 2) Correct zcobol\z390\GEN_VAR ELSE to AELSE. 3) Correct zcobol\z390\GEN_PROC_START to save SYM_TOT locally for symbol scan to check for pointers to add. 4) Correct support for EXEC CICS COBOL when either or both DFHEIBLK or DFHCOMMAREA are omitted and must be automatically generated for linkage. 2) Correct split literal support to handle both " and ' quotes. 5) Support COPY member OF/IN ddname. 7) Change START verb to ZCSTART, END verb to ZCEND, and SD to ZCSD to avoid az390 assembler conflicts. 9) Change zc390, mz390, az390, lz390 to set RC=12 for errors and RC=16 for abort. 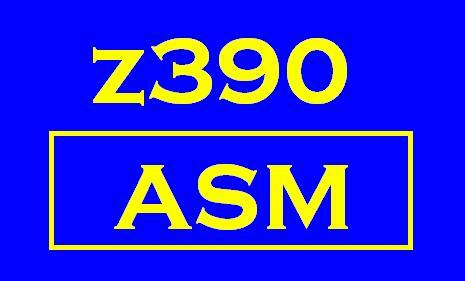 10) If az390 aborts running in ASM mode, change abort id to MZ390. 11) Correct initialization of tz390 pattern matching to support @file option file processing by zc390. 12) Change abort messages to say abort instead of error for zc390, mz390, az3290, lz390, and ez390. 13) Prefix COBOL data names starting with digit with #. 14) Ignore semicolons and commas. 15) DISPLAY is verb only in procedure division. 19) Replace & with && in literals. Replace "" with " and ' with '' if original literal was in double quotes versus single quotes. 20) Add special names paragraph verbs ALPHABET, CLASS, CURRENCY, CURSOR, CRT, DECIMAL-POINT, LOCALE, ORDER. 21) Correct parser to generate LABEL name, SECTION for SECTION name definition in area A. 22) Generate pgm_ZC_LABELS.CPY file and generate COPY to include it after ZCOBOL call in MLC source to define duplicate paragraph names in sections for use in generating qualified labels only when required. 23) Only treat lines with * or / in position 7 as comment lines. Some NIST programs such as NC174A have other debug codes. 1) Correct zpar\ZPARGEN.MLC to ignore period on first line of DIR on XP systems versus Vista. 2) Add ZPARSUM1 which is the same as ZPARERR with the addition of breaking down START/STOP statistics by first 2 characters of program name. 3) Add ZPARSUM2 which reads output of ZPARSUM1 and produces summary report of program translation, assembly, and executions by first 2 characters of name along with total RC=0 and RC>0. See NIST COBOL test suite summary for example. 4) Add ZPARMLC which reads one or more MLC or BAL source files and generates a frequency distribution report on the opcodes and macro call names used. The report is in descending order by frequency followed by alphabetical order by opcode or macro name. See the zcobol NIST test program analysis of both the translated macro calls and generated BAL opcodes. 2) Add new macro ZCSTART for START verb, ZCEND for END verb, and ZCSD for SD verb. 4) Add support for ACCEPT field with default DDNAME=pgm.DAT or SYSIN or console. 5) Correct subscripts, indexes, and reference modification. 6) Indicate FUNCTION not supported yet in IF, MOVE, CALC, and EVALUATE. 7) Support duplicate paragraph names within different sections and use qualifier to reference paragraphs in different sections. Add statistics on total sections, paragraph names, and duplicates. 8) Use ZCNUMLIT.CPY to scale literal values in WS, GEN_MOVE, and GEN_COMP. 9) Correct IF to support omitted subject and relational test such as A EQ 4 OR 5 which reads A EQ 4 OR A EQ 5. 10) Support GO TO. as model for ALTER use branch to last PG causing loop if ALTER not set. See NIST test OBNC1M. 11) Use CLCL in GEN_COMP to pad short X/A type fields in compare. 12) Add support for 88 level multiple values including ranges of the form n1 THRU n2.